Hardships came in many forms, and scars could go deeper than what was seen on the skin. Quinn Rafferty had endured one of those childhoods that most considered unimaginable. When his circumstances had changed, he had a difficult time believing that something could be good. He no longer needed to live in fear. As an adult, the fear may have subsided, but he still remained alone. There were only a handful of people he cared for. Then he fell into the eyes of Sara. Sara Davis was tired of running. She was tired of working menial jobs, and living in squalor. Being offered a nice apartment for a reasonable rate was a prayer come true. She couldn't stay long, she never stayed any place long, but she felt safe. She felt clean. And when she saw Quinn, she felt things she hadn't felt in a very long time, if ever. She wanted to trust him, but she couldn't. She wanted to stop running, but wouldn't. She wanted Quinn, but she knew it could never last. No matter how much she might want it to. 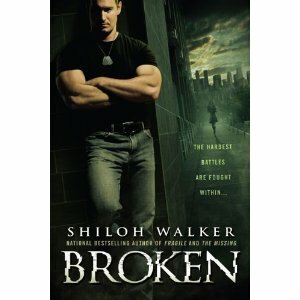 Broken was an emotional story of two souls healing together. It was a poignant story of two people overcoming tragic pasts. I had adored Quinn from when we met him in Fragile, when his brother Luke met Devon. Quinn demanded his own story. He needed a strong heroine who could fight for him, and help mend his battered soul. In Broken, he is given the perfect heroine. The interaction between Quinn and Luke was a highlight - with Quinn displaying a vulnerability he would never show anyone else. However, I do wish Luke and Devon had been a larger part of the story. Seeing Luke and Quinn together is why I wanted Quinn's story, and I was disappointed that it was such a small part of Broken.